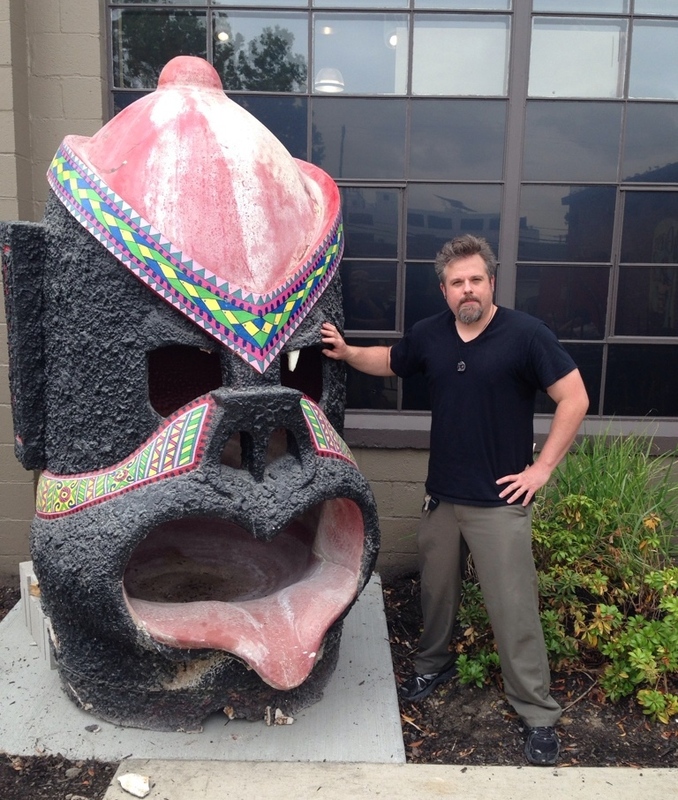 In 2013 the Fraternal Order of Moai acquired the iconic fountain from the famous Kahiki Supper Club in Columbus, Ohio, for preservation and public display. The Moai, a non-profit 501(c)(10) organization founded in 2005, successfully won the fountain at an auction of items from the Kahiki, a beautiful Polynesian-themed restaurant that opened 1961 and closed in 2000. The largest piece in this auction was the Monkey Fountain, known as "George," that greeted people as they entered the lobby. Millions of people posed for pictures next to George while the restaurant was operating. Since 2000 George has been installed in the lobby of the Kahiki Foods building. The Moai, in collaboration with the Grass Skirt Tiki Room in Columbus, planned to relocate George to the restaurant and put him on display in working order. Ownership of the fountain has been retained by the organization. This will allow tikiphiles and Kahiki Supper Club fans to visit him and pose for pictures once again. Working together, local representatives of the Order and the management of The Grass Skirt prepared a platform and a plan for moving the fountain once Kahiki Foods had it cut away from the floor of the office building lobby. Matthew "Kuku Ahu" Thatcher, founder and past national president, said, "The Moai are passionate about preservation of artifacts from the lost tiki temples like the Kahiki and this was an opportunity to secure a large signature item and place it on public display instead of a private collection. Having George moved in time for this summer’s Hot Rod Hula Hop was something we really wanted and I am really pleased that he is here at his new home." Carmen Owens, co-owner of The Grass Skirt, said, "Having an historic item from the great Kahiki, especially one of such significance as George, is amazing. It really connects us to Columbus history." Once again this year The Grass Skirt will be working with the Kahiki Chapter of the Order on the annual Hot Rod Hula Hop, a three day tiki themed event in Columbus which will be held August 8th and 9th. Proceeds from the event will be donated to Cure CMD, a 501(c)(3) nonprofit dedicated to bringing research, treatments and in the future, a cure for Congenital Muscular Dystrophies. There is more work to be done to secure George in his new home and care for him so stay tuned for the next chapter in the story of George.